Z-Meter – PL Engineering Ltd.
Thermoelectric coolers are the solid state devices with very long maintenance-free lifetime. Being properly installed once in a final product, thermoelectric coolers may provide more than 25 years of continuos operating in normal conditions. However mounting procedures and/or improper handling may increase the risks of TEC damages. Thus the reliable quality control for thermoelectric coolers is required , during and after mounting procedures. Peltier Z-Meters™ are the best solution for thermoelectric coolers express quality control and performance testing. The most usual way is to check TEC AC Resistance (ACR) and to compare with initial ACR value specified by TEC manufacturer. This method is quick and easy, and usually enough to understand if TEC is damaged or not. But it gives only a partial info about TEC condition. 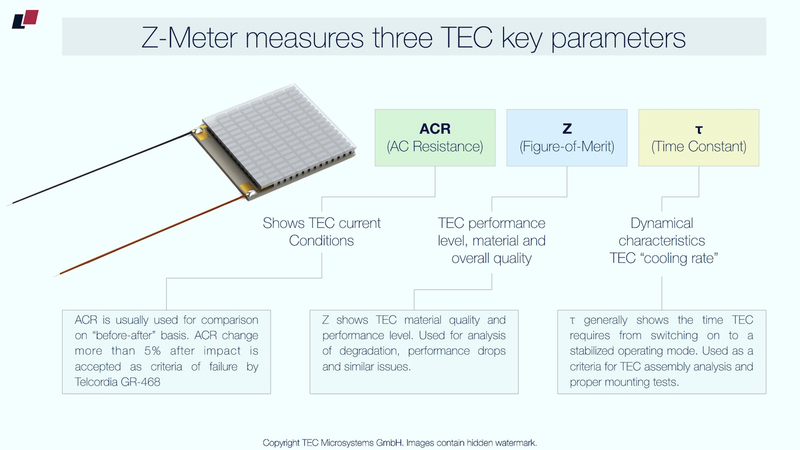 Z-Meters give more info about TEC actual quality and performance level by direct measuring three TEC key parameters: ACR, Figure-of-Merit (Z) and Time Constant. The combination of these three parameters gives a detailed info about TEC quality, performance level and operating conditions. It can be used for detailed TEC quality control (income and outcome), TEC R&D analysis, developments and analysis of TEC integrating/mounting processes and even a comparison of same TEC solution provided by different vendors. Peltier Z-Meters™ are the best solution for thermoelectric coolers express quality control. Z-Meters provide fast and accurate measurements to get the complete info about thermoelectric cooler. The measuring process is based on Harman Method. The following parameters are measured directly: AC Resistance (with a reference to required ambient temperature); Thermoelectric Figure-of-Merit (Z) to show TEC material and assembly quality; and Time Constant. Exactly the combination of these three parameters gives the complete information about TEC materials, quality and performance level. And it can be used for performance analysis, dTmax estimations (for single-stage TECs) and the most important thing – quick detection of damaged or failed TECs during manufacturing or handling processes. DX4095 Peltier Z-Meter™ Mini is a pocket size device as small as typical USB flash drive. It has the same measuring functionality as standard Peltier Z-Meter and focused mainly on single thermoelectric coolers testing, R&D, trial batch check and laboratory usage. Z-Meter Mini uses external clips only. Optimal for occasional testing. DX4090 Standard Peltier Z-Meter™ is the universal device for thermoelectric coolers quality control and R&D. It has two measuring interfaces – inner clips and external clips. The device is ideal for express control of small and medium size batches, R&D projects, income, in-process and outcome TEC control. DX4190 10-position Peltier Z-Meter™ is the perfect for mass production and large TEC batch quality control. The device has 10 channels allowing simultaneous measurements of 10x TECs at once. It has internal and external clips interfaces. Various accessories are available as well (for lead-less TECs setup, sub-assemblies and etc). 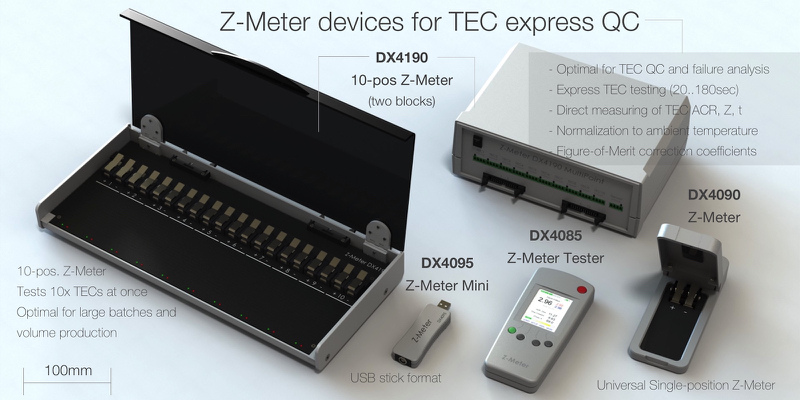 DX4085 Z-Meter™ Tester autonomous device with no connection to PC required. It has 2.4″ LCD screen for information output and combines three devices in one: portable Z-Meter for TEC parameters measurement, voltmeter to check TEC operating voltage and digital thermometer for ambient and operating temperature tests.